The stature of literature and all it has come to stand for started to crumble down on October 13. This was when the Nobel Committee had announced that Robert Dylan, mainly known as Bob Dylan, would receive the Nobel Prize for Literature. Literature is defined as a single writing deemed to have artistic or intellectual value. Major forms of literature have been recognized as novels, short stories, poems and scripts. Novelists, screen writers and poets were all deemed adequate to receive one of the most prestigious prizes one preforming language arts could receive; The Nobel Prize for Literature. The Nobel Prize for Literature has been awarded annually to a literate that has produced “in the field of literature the most outstanding work in an ideal direction...” (Alfred Nobel). On October 13 of 2016, when it was announced that Bob Dylan; an iconic American songwriter, would receive the prize, many were confused and even concerned about the future course literature would take in the years to come. There is no doubt that Bob Dylan is a talented and prestigious artist, but the real question is if he is someone ‘worthy’ enough to receive a literature prize. “The only definite thing about what went down that day was the priceless expression on the audience’s faces when he was announced laureate...,” said James Clitheroe, a Professor in the Department of Humanities in Hanyang University (HYU). Bob Dylan is a famous songwriter who greatly influenced the course of American music in the mid-late 20th century. There was not a single person in the Western society who did not think of Bob Dylan when they see his signature worn out blue jeans and acoustic guitar. The tunes that would come from his guitar were diverse, since he had experimented with the most renown American musical genres- from folk, gospel and country to even rock and roll. However, it was not only his ability to play any genre known to the American public that made him such an iconic musician, but it was also because of his lyrics which entranced every single person who listened to his song. Many call Bob Dylan a wordsmith for his uncanny ability to shape words into a delicate and aesthetic form. His lyrics not only speak of love, but also speak of political issues and social unrest that were eminent in the American society in the late 20th century. His early songs like <The Times They Are a-Changin’> was the number one protest song for the American Civil Rights Movement in the 1960’s. His lyrics formed a powerful intellectual enlightenment that inspired many who participated in such a social movement. His music career spans over a fifty year period and during that time he had received numerous awards including eleven Grammy Awards, a Golden Glove Award, and an Academy Award. He has collected most of the musical awards known to the Western society, but last October was the first time he was bestowed an award that celebrated his achievement in literature. Most opinions stem from the inclination that music and literature are two different spheres, and should not be converted into one another. “The music industry is separate and already has many awards to give out, most which Bob Dylan has already received. In that sense, I do think that it was quite unfortunate that the prize didn’t go to someone who is recognizably works in the language arts...”, said Peter Matthews, a professor in the Department of Humanities in HYU. In favor of the opposition, songs are not always poems. Even some of Bob Dylan’s songs are far from poetic once you subtract the words from the melody. Therefore, it is hard to say that he himself is a renowned literate when most of his work has nothing to do with literature. “I’m not trying to say that he isn’t worthy, because he is. I just think that it is the wrong prize for a great guy.” said Gary Turnham, a professor in the Department of Humanities in HYU. While most are furious about the turn of events, the rest have rejoiced over the fact that Bob Dylan was finally recognized for his deeds he has done in the field of language arts. The proposition also states that poems are like lyrics to a song, minus the melody. Monique Toung went on to say, “A great lyricist is a poet, and a great poet is a lyricist, in that their words sing to us from the page as a hymn, lullaby, anthem or dirge.” Granted, most of his songs might not actually fall under the category of poetry, the one’s that do have more than enough skill and potential to be granted the Nobel Prize for Literature. 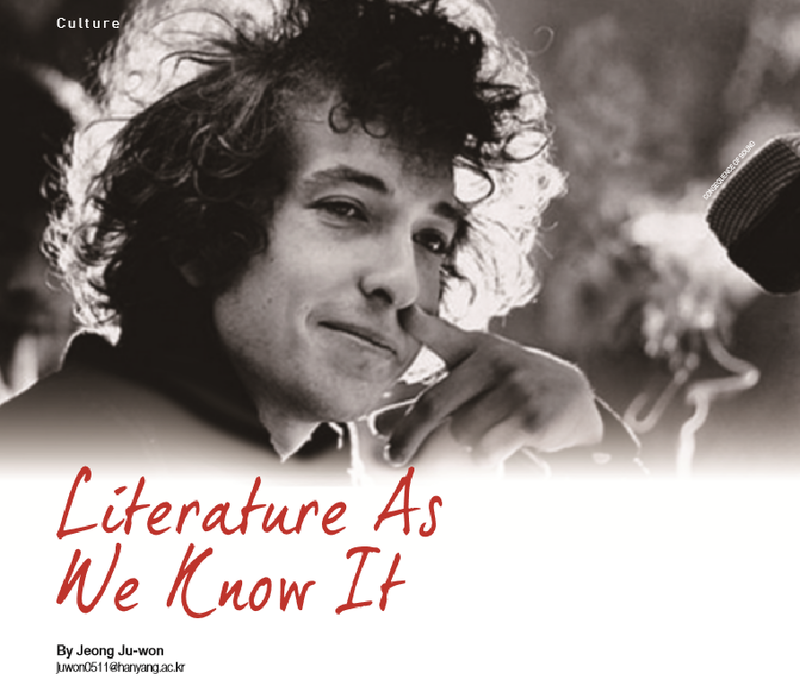 What is and is not literature is not a recent debate, but an ongoing conversation that has flared once more into the spotlight with Bob Dylan receiving the Nobel Prize for Literature. The only right answer to this debate may be the answer that one thinks is the most logical. There is no point in arguing about what is right or wrong. Instead people should focus on the true meaning behind this whole event; which is that the Nobel committee has given us an opportunity to reexamine our notions of what defines literature in the modern age.